Surface map at 0700z July 22, 2014 shows temperatures remaining in the upper 70s and lower 80s with dew points well into the mid-70s. Computed CAPE from the 22.00z HiRes-ARW-WEST valid at 00z Wednesday 23 July 2014. CAPE values over 4000 J/kg. 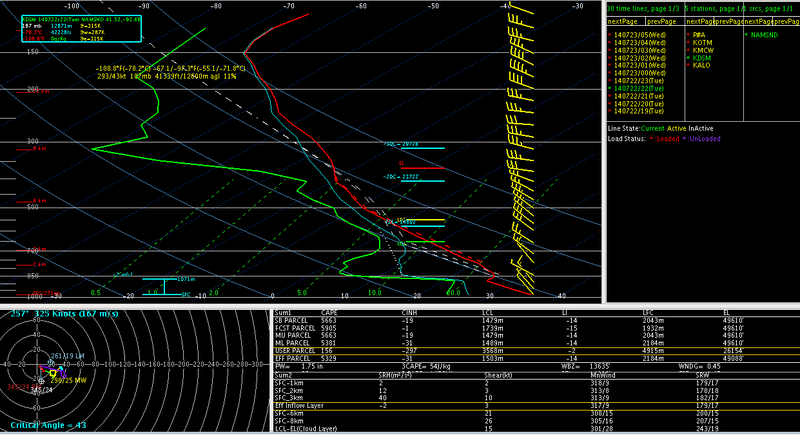 The Des Moines Forecast Sounding from the 22.00z NAM valid at 22z Tuesday 22 July 2014. Tremendous CAPE but very little shear present. Sounding has a very strong cap in place +16C 700mb temperature.